Recorded on Sunday night at the end of Auto Assembly 2012. I apologise for the slightly dubious quality of it, as it was done at the bar itself. This both refers to the audio and the language used, which is explicit to say the least. 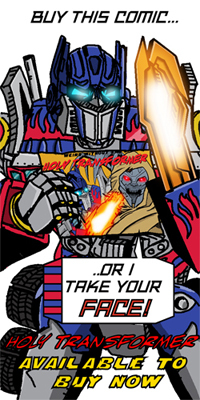 We tell the world what Hollyoaking is, Roph gives us insights into fighting behind enemy lines in World War II, and we run down and we do mean run down the Fun Publications comics before giving some feedback on Botcon 2010. A little out of date but still pertinent. Guest stars aplenty – Karl Thurgood, Nick Davidson, Tony Baker, Matt Marshall, Andy Kiernan, Marc Graham, Matt “Timelord” Clarke and Glenn Jakeman of Back to the Eighties are all involved.